all within a bordure vert (added 1575). Out of a coronet or, an eagle rousant sable, wings or. Within weeks of the grant from Robert Cooke, the college erected its new coat of arms, carved in stone, in Old Court, over the entrance to the dining hall. The first quarter (Kingdom of Hungary) is shown here barry argent and gules (silver at the top), as used by René himself [ MS Egerton 1070 Pt 2 f. 4v], and by his daughter Margaret [her Prayer Roll detail], although the Árpád stripes are more usually seen in Hungarian contexts as barry gules and argent (red at the top). 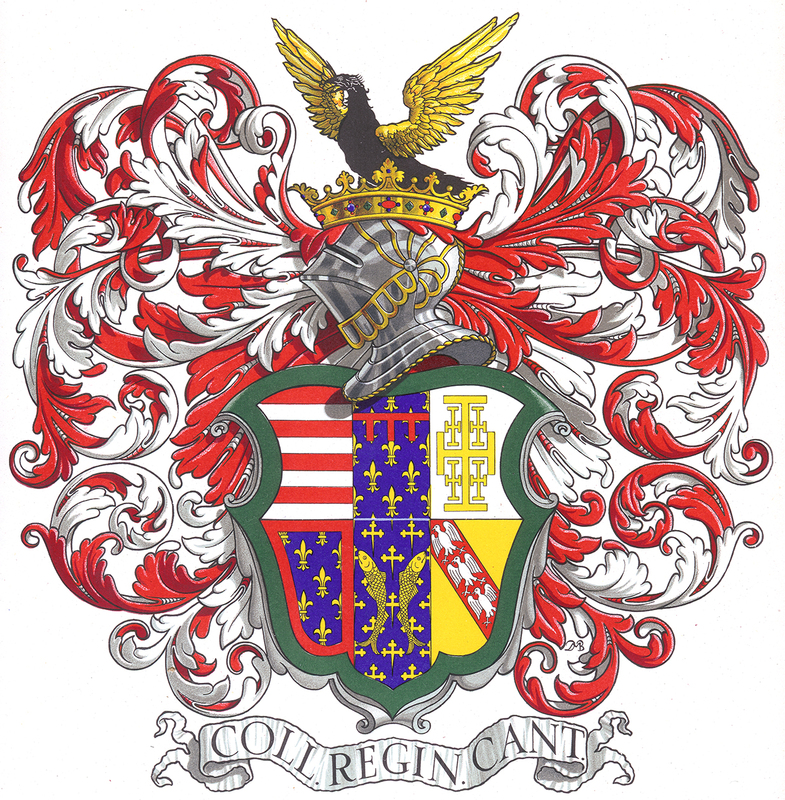 But it has to be said, in the context of the arms of College (descended from René, Margaret, and confirmed in the 1575 grant), only the former is correct, and the latter is a 20th century aberration. The earliest modern example found so far of the incorrect gules and argent is in Oldfield’s 1931 book [ The Arms of the University and Colleges of Cambridge , by Richard William Oldfield, 1931], followed by Plate 12 of Browne & Seltman [ A Pictorial History of … Queens’ College Cambridge , 1952], which has unfortunately been used as a guide for later reproductions of the arms in College. So, at the time of writing (2016), the college flag is incorrect, and the arms painted in Old Court are incorrect, amongst others. In the second quarter (Anjou ancient, or Kingdom of Naples [modern name], or Kingdom of Sicily [contemporary name]) there is historical evidence for the label being red, although it was mistakenly blazoned as silver in the 1575 grant of arms: both versions can be seen in representations of the arms around College. Both René and Margaret used red [see examples in previous paragraph]. In those times, the word Sicily could apply both to the island, and to the southern mainland ruled from Naples: Margaret, on her royal seal, was able to describe herself as daughter of the king of Sicily … , by virtue of her father claiming the kingdom of Naples, not of the island of Sicily. He also lost Naples itself in 1442. The third quarter (Kingdom of Jerusalem) uses gold on silver, a combination which is rare in heraldry, being an exceptional breach of the Rule of Tincture. The four small crosses are here shown potent, although versions with plain crosses can also be found: René and his predecessors used plain crosses, but crosslets potent were used in some contemporary representations of the arms of Margaret [Royal MS 15 E VI, f. 3r at right margin], in her Royal Seal, and in the first seal of the College; in the 1575 grant these small crosses are not described as potent, but are drawn potent in the marginal painting, and appear potent in the 1575 carved coat of arms in Old Court. The fourth quarter (Duchy of Anjou) consists of the arms of France with a red border as a mark of cadency. In the fifth quarter (Duchy of Bar), the barbels are an allusion to Bar. In the 1575 grant the barbels were incorrectly described as luces (pikes). The crosses crosslet for Bar should be fitchy, as shown above, and as depicted in the Royal Seal of Margaret and the first seal of the College, but the 1575 grant failed to state this: versions both correctly fitchy and incorrectly non-fitchy can be seen around College. In this respect, the arms in Old Court, at the north end of Old Hall, and in Chapel are incorrect, amongst others. René himself [ MS Egerton 1070 Pt 2 f. 4v], sometimes used cross crosslets fitchy at foot [ Les princes militaires de la Maison de France , by Amédée Renée, p. 207], but that style has not been seen in any depictions of the arms of Margaret. Another characteristic of the arms of René [ MS Egerton 1070 Pt 2 f. 4v] is that, almost always, each barbel has in its mouth the foot of the cross crosslet fitchy above, with the cross crosslet fitchy rotated if necessary to fit the mouth below. There is, in the Old SCR at Queens’, one piece of stained glass of the arms of Henry VI and Margaret which reproduces this detail. With good enough eyesight, one might convince oneself that the same detail appears on Margaret’s Royal Seal and the first seal of the College. Broomfield [ The Heraldry of Queens’ College , 2016] points out that the cross crosslets fitchy should be shown semy, or sown, in this field so that some of them are cropped by the margins (as with the fleurs-de-lis in the second and fourth quarters): in this respect the illustration above on this page is not quite correct. Both styles can be seen in representations around college. In the sixth quarter (Duchy of Lorraine), the alerions are an allusion to Lorraine. An alerion is supposed to appear similar to an eagle with no beak or claws, but in many instances of the college arms they look more like eagles. In the 1575 grant, they were described as Egles. The green border added in the 1575 grant appears to be intended as a heraldic difference, to distinguish the college arms from those of Margaret herself. One may speculate that this use of green might be the origin of the green used in the college scarf and for sports kit colours. 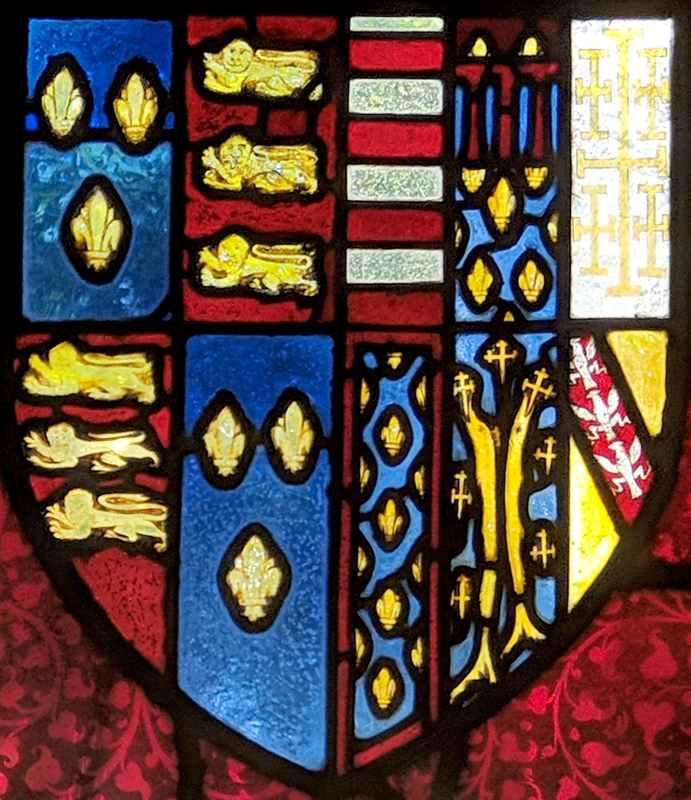 A full depiction of the college arms, including the helm and mantling, was made by Dorothy Buckmaster, some time in the first half of the 20th century. It was used as Plate 12 in A Pictorial History of the Queen’s College of Saint Margaret and Saint Bernard, commonly called Queens’ College Cambridge, 1448–​1948 , by Archibald Douglas Browne & Charles Theodore Seltman, and reproduced widely afterwards. Unfortunately, this depiction incorporates a significant error: in the first quarter, the tinctures of argent and gules have been incorrectly swapped (see the discussion on quarter 1 above). This error has been propagated to all representations of the arms that used this one as a reference, including the current college flag, and the painting of the carved stone arms in Old Court. These are not actually arms of the College, but, rather, a badge. Sable a cross and crozier in saltire or surmounted by a boar’s head argent. The origins of this device are shrouded in considerable uncertainty and even possible downright error. Most of the explanations commonly heard today are the inventions of early historians, reproduced uncritically down the centuries, with little or no clearly established basis in verifiable fact. There has been a succession of heraldic authors each giving a different description and colouring of the design: the currently accepted colouring (shown here) appears to have evolved as recently as the 19th century. Today, this badge is widely used by College sports clubs, and also appears in connection with food or dining. The earliest known depiction of this design is on a page in the 1572 Catalogus Cancellariorum… of Archbishop Matthew Parker, displaying the purported arms of the University and colleges. In early editions, this page had several errors (e.g. arms of Peterhouse, arms of the University), and it was revised a number of times in subsequent editions, so its reliability as an authority might be in question. No trace has been found of this boar’s head design in the buildings or records of the College originating before 1572, and it is not known from where Parker obtained his information. Parker gave no information on the tinctures to be used in this design. Parker’s boar’s head design was reproduced in Speed’s map of Cambridgeshire of 1610 as being the arms of Queens’ College, although the college had long since been re-granted the arms of Margaret of Anjou in 1575 (and John Hamond’s 1592 plan of Cambridge showed Queens’ as bearing the arms of Margaret of Anjou). In this depiction, the badge as printed is tricked to show tinctures argent on gules (silver on red), and coloured versions of the map have been so coloured. It is not known what the authority was for these colours. The ca. 1640 plan of Cambridge sometimes attributed to Wenceslaus Hollar reproduces the same design and tricking for the arms of Queens’ College. ... This I humbly conceive bestowed upon them by Richard the third (when undertaking the Patronage of this foundation) in allusion to the Boar which was his Crest; and wherein those Church implements disposed in Saltyre or in form of St. Andrews Crosse, might in their device relate to Andrew Ducket so much meriting of this foundation. It is to Fuller’s humble conceit , rather than any factual evidence, that we owe the tradition of ascribing the boar’s head to Richard III. Many later historians quote Fuller uncritically on this point, although few accept the suggested reference to Andrew Docket implied by the saltire arrangement of cross and crozier. There were several college seals in use in the 15th and 16th centuries, of which impressions survive: none of them feature a boar’s head. Would the college have displayed a Ricardian symbol during Tudor times? A white boar (the complete beast, not just the head) was indeed the badge of King Richard III of England. Richard’s wife Anne Neville was the third Queen consort to be patroness of the College. Both Anne and Richard were great benefactors of the College, although their benefactions were subsequently lost to King Henry VII. Item antiquum sigillum argenteum ex dono Ricardi sc̃di R. Anglie insculptum porcellis seu apris. Item: an ancient silver seal given by Richard the Second, King of England, engraved with a little pig or boar. Here, the abbreviation sc̃di for secundi (second) is clearly a mistake for tertii (third). The seal does not survive, and no impression of it has ever been found, so it is not known whether its appearance was anything like the badge now used, nor whether it was ever used as the college’s corporate seal. In 1729, Samuel Drake published a new edition of Archbishop Parker’s 1572 page of University and college Arms (see above). The hatching used indicates that the colours were gold on black, although that information could not have been gleaned from the original 1572 version. Around 1733, the Boar’s Head badge was carved in wood as part of the new panelling in the Hall. It has been re-painted many times since then, so we cannot say what the original colourings were. This is, in fact, the earliest known depiction of the Boar’s Head badge in or on the buildings of the College. The other coat which attracted Fuller’s attention is more accurately blazoned thus, Sable, in bend dexter an episcopal staff ensigned with a cross pattée, argent, surmounted of a crosier in bend sinister or, over all, a boar’s head couped, in fesse, of the last. It is properly blazoned as: sable, a cross and crosier in saltire or, surmounted by a boar’s head argent. The boar’s head is usually represented gold, but is obviously derived from Richard III.’s badge of a white boar, and should therefore be silver. The two staves are the cross generally borne by St. Margaret, and the crosier of St. Bernard. Thus, Hope unilaterally established the tinctures used today, as a departure from previous practice: most earlier descriptions had the boar’s head in gold. He also appears to have been the first author to suggest a connection between the two ecclesiastical staves and the two patron saints of the College, but gave no authority for this idea. In the accompanying depiction of the badge, the appearance of the cross had changed: previous depictions were fairly unanimous that it was a cross pattée, but he appears to have changed the cross to look more like the cross borne by St Margaret of Antioch in depictions of that saint. One wonders whether he did that to artificially reinforce his theory connecting the staves with the saints. Suppose, just suppose, that Matthew Parker, in 1572, had been incorrect in showing the arms of Queens’ College to be the boar’s head device, and that the college only adopted it retrospectively because so many historians kept telling the story? Queens’ College scarves are green with two white stripes. When made to the traditional colours, the green in Queens’ College scarves is darker than the green in Girton College scarves. Other scarves for clubs within college are here. 1729: within the above, the illustration of Coats of Arms, reproduced from an earlier Catalogus version than either of the above two. 1885: Seals of the Colleges and of the University of Cambridge , by William Henry St John Hope, in Proceedings of the Society of Antiquaries of London (Second Series), 10, pp. 225–​252, Queens’ at pp. 242–​244. 1895: and again in Proc. Cambridge Antiquarian Society , Vol. VIII(1891–​94):107–​133. 1915: The Book of Public Arms , by Arthur Charles Fox-Davies, Revised Edition, pp. 640–​1. Queens’ College Arms and Boar’s Head badge by Queens’ College Cambridge are licensed under a Creative Commons Attribution-ShareAlike 4.0 International License. Queens’ College Arms with Crest in SVG format, for use on the web. Queens’ College Arms with Crest in PDF format, for printing. Queens’ College Arms with Crest in EPS format, for graphics experts (right click and “Save target as”). Queens’ College Arms with Crest in EMF format, for Microsoft Office (right click and “Save target as”). Queens’ College Arms (without crest) in SVG format, for use on the web. Queens’ College Arms (without crest) in PDF format, for printing. Queens’ College Arms (without crest) in EPS format, for graphics experts (right click and “Save target as”). Queens’ College Arms (without crest) in EMF format, for Microsoft Office (right click and “Save target as”). Boar’s Head badge on black, in SVG format, for use on the web. Boar’s Head badge on black, in PDF format, for printing. Boar’s Head badge on black, in EPS format, for graphics experts (right click and “Save Target as”). Boar’s Head badge on black, in EMF format, for Microsoft Office (right click and “Save target as”). Boar’s Head badge in outline, in SVG format, for use on the web. Boar’s Head badge in outline, in PDF format, for printing. Boar’s Head badge in outline, in EPS format, for graphics experts (right click and “Save target as”). Boar’s Head badge in outline, in EMF format, for Microsoft Office (right click and “Save target as”).